Pedro Pablo Kuczynski, Alan García and Alejandro Toledo all took undeclared campaign contribution in exchange for pledges to have the Brazilian construction giant win local tenders, prosecutors said. Prosecutors in Peru have opened an investigation into allegations that three former presidents took bribes disguised as campaign funds from Odebrecht, the Brazilian construction giant at the centre of region-wide political scandals. 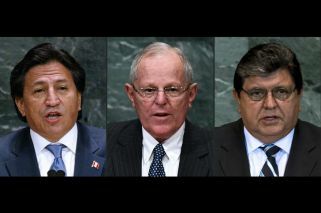 Former presidents Pedro Pablo Kuczynski, Alan García and Alejandro Toledo all took undeclared campaign contribution in exchange for pledges to have the Brazilian construction giant win local tenders, prosecutors said. Prosecutor José Domingo Pérez opened a preliminary investigation of money laundering against the trio, as well as three individuals close to each of them, according to a statement from his office. Prosecutors had previously announced they are investigating former president Ollanta Humala for allegedly taking US$3 million in bribes from Odebrecht. The four ex-presidents led Peru between 2000 and 2018. The investigation stems from questioning of Jorge Barata, a Brazilian who was a former Odebrecht boss in Peru. He told Brazilian investigators that he doled out millions of dollars to Peruvian presidential candidates between 2001 and 2016. In the 2011 elections, Odebrecht gave money to four candidates, Barata told prosecutors: US$1.2 million to opposition leader Keiko Fujimori, daughter of former president Alberto Fujimori; US$700,000 to Toledo; and US$300,000 to Kuczynski. Meanwhile, Barata said political aide Luis Alva Castro, who was close to Garcia's campaign, received more than $200,000. While Keiko Fujimori is not directly under investigation, two of her senior 2011 campaign aides are. The suspects have all claimed innocence, and on Sunday Alan Garcia took to Twitter to lash out at prosecutors. "For the sixth time in five years I am being investigated," Garcia wrote. "Others sell out, not me." Odebrecht officials earlier said that they paid Toledo US$2 million to build a highway crossing the Andes and the Amazon jungle that links the Pacific and Atlantic oceans. The highway was inaugurated in 2006. Peruvian prosecutors are currently seeking Toledo's extradition from the United States to face corruption charges. Peru is the Latin American nation that has been most seriously rocked by the Odebrecht scandal, after Brazil itself. President Martín Vizcarra – who was ambassador to Canada as well as vice-president – took office on March 23 after Kuczynski stepped down amid corruption allegations, shortly before he was to face impeachment.